another iconic bare tree, this time in pewter. i don’t know what it is with me and bare trees, but i just think they’re so cool. i made this one for my urban prairie collection. i felt like it needed a little something, so i added a tiny peridot to swing from the branches, wrapped with oxidized sterling silver wire. in keeping with the simple, timeless theme, i knotted it on a thin black leather cord. i wanted to keep it spare and classic. it’s available at my etsy store for $26 USD. and i’m still donating $5 to red cross for every item purchased from my etsy store! mmm…it’s so pretty i could eat it! i love the warm rich yellow of golden yellow chalcedony–and this faceted one pairs perfectly with micro-faceted garnets and hessonite garnets. the deep colors remind me of caramel! mmm, caramel. i think the sterling silver might get stuck in your teeth, though, so this one is best worn around the neck. i just want to wear it to ward off the doom and gloom of the rain clouds on their way. this one-of-a-kind necklace measures 19 inches, though i’d be happy to shorten it for you, and it’s available at my etsy store for $50 USD and arrives, as usual, nestled safely in my handmade paper box. and i’m still donating to the red cross: $5 for every item purchased through my etsy store! and for everyone who ‘hearts’ my store by adding me to their etsy favorites (you’ll need to sign up for an account if you don’t already have one, but it’s free) i’ll donate $1, no purchase required. check it out! 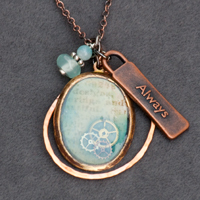 this pendant is a cool combination of found and made objects; a pendant that i made by antiquing a brass charm and encasing an image and a few watch gears in epoxy, a hand-hammered copper ring, two adventurine beads on an antiqued sterling silver headpin, and a found charm that says ‘always’. then i strung it on a copper chain that i antiqued as well. mixed metal sentiment. what a cool declaration! i really like that the oxidation/antiquing colored the epoxy to make it look aged as well. a total success! it’ll be up on my etsy store soon, as part of the new jalopy collection, with more to follow! i’ve just rearranged my etsy store for–what i hope is–easier navigation. instead of having things listed by earrings, necklaces, etc., i’ve moved things around into collections. now you can find all the funky items grouped together for example. if you want something natural, they’re all together, too. delicas contains my finer more delicate pieces, like the winter blues necklace to the left. here you’ll find jewelry that is simple, elegant, and made exclusively of sterling silver (or gold upon request) semi-precious stones, pearls, and silk. urban prairie is a collection inspired by nature and contains a wider variety of materials. you’ll still find sterling silver and semi-precious stones, but you’ll also find pieces containing wood, shell, and sea glass. these pieces tend to be more substantial, and natural but with a modern feel. new jalopy will have all of my jewelry that strikes me as fun and funky. you’ll find vintage lucite, like in the earrings at the left, as well as vintage german glass and other metals, like copper and gunmetal. bees knees paperie for those of you who have wanted to purchase my handmade origami boxes in fun prints. need ’em in a certain color of theme? custom order! i’ll also have my handmade paper and ribbon tags. 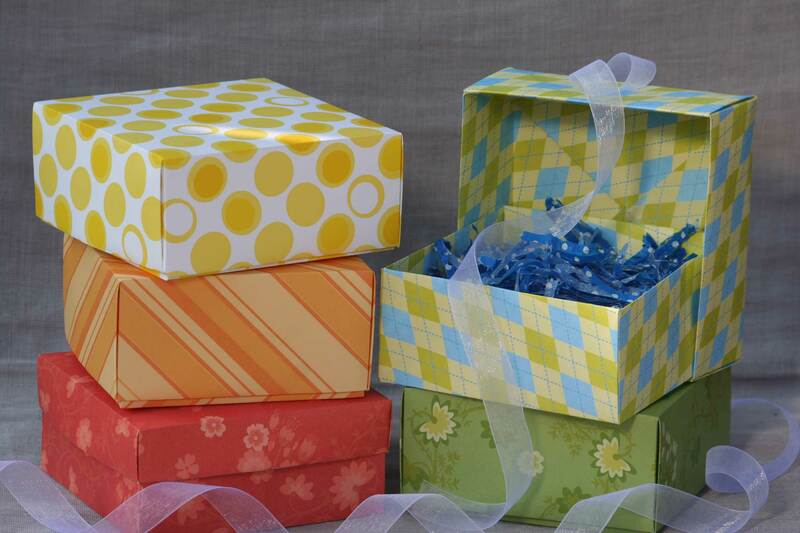 perfect for tucking in gifts or using as thank you notes (that’s how i use ’em!). of course, i’ll continue to make quality items with an attention to detail no matter what! hope you’ll visit my etsy store to check out the new changes! when i saw these gorgeous bali sterling silver beads, i just had to have them! they are hand-carved with a beautiful open scrollwork. and because they’re hollow, they’re surprisingly lightweight. i struggled with the perfect accent for them, but they really are the accent, so i just added small swarovski crystals and hung them from sterling silver earwires. earrings measure just under 1.5 inches in length, including earwires. they’re available at my etsy store for $42 USD and arrive in my handmade paper box via usps priority mail. ps – for a limited time, i will donate $5 for each item purchased through my etsy store to the aid organization of your choice for haiti. participate in ‘hearts for haiti’, too–add my store to your favorites list and i’ll donate a $1 to red cross, whether or not you make a purchase. in addition to my own donation, my etsy store has raised $19 for the alleviation of suffering in haiti (donated to the red cross). help me do more by going to my etsy store and making a purchase or adding my store to your etsy favorites. for each item purchased, i’ll donate $5 to the red cross or aid organization of your choice. every time someone adds me as a favorite, i get a ‘heart’ added to my store (you’ll need a free account). for each ‘heart for haiti’ that i get, i’ll donate $1 to the red cross. free for you, help for haiti! i love orange! so i love carnelian, and these faceted beads are eye-catching and just flat out fabulous. i’ve paired them with 3 tiny micro-faceted beads of hessonite, an orange garnet, for maximum orange. the facets throw off the light as these individually wire-wrapped beads dangle from your ears. they’re available at my etsy store for $38 USD. personally, i’d pair them with the pure warmth necklace. i’m still donating $5 for each item purchased through my etsy store to the aid organization of your choice to help the victims of the haiti earthquakes.